As you can see from the above photo, this cigarette burn hole is right in the centre of the seat - the bit you sit on! This means that the only way to repair this burn hole is with a very hard wearing repair. 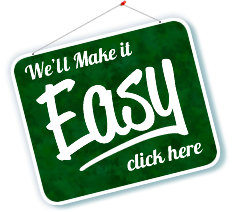 Some companies do offer a service where replacement fibres are glued into place making an invisible (or near invisible) repair, but we have found that this doesn't last long once you start sitting on it. 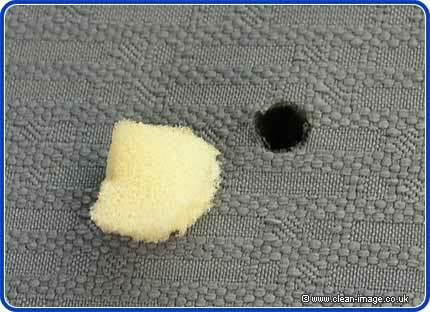 So while we may recommend if for headlinings and the backs of seats, we believe the best way to repair the kind of damage in these photos is to sew it up with needle and thread. 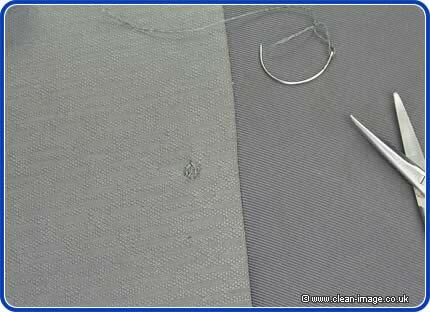 First we cut some foam to act as padding which is then pushed into the hole, then we used colour matched nylon thread and a curved needle to repair the hole. The above photo shows the completed repair. It is not invisible, but is hard wearing enough so that it will last. Above is a close up of the repair which cost £19.95. There are other options and methods of dealing with damage such as this. 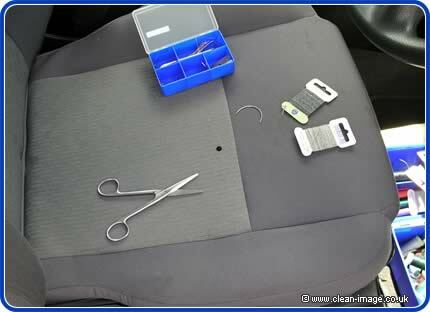 An upholsterer or trimmer could replace the damaged panel in the seat, or depending on the position, an extra seam can be put into the seat panel which would hide the burn... obviously a similar seam would have to be put into the other front seat so that they both match. Obviously this is a much more expensive option. The Girlfriend has accidentally put a cigarette into the headlining, which has made a nice little hole. You can see there is a patten in the headlining, so we're not going to get this perfect obviously, but it will take your eye off the burn. 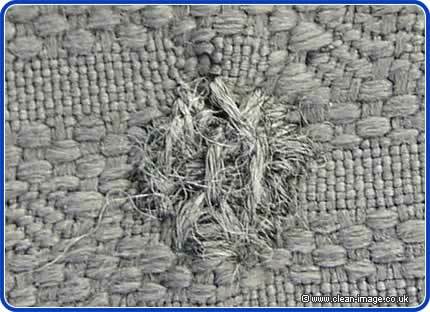 See how Geoff repairs a ripped carpet by replacing the carpet fibres.